I love this fan image (unfortunately retired) from Sweet Stamp Shop and I thought of it immediately when I saw this cue word. 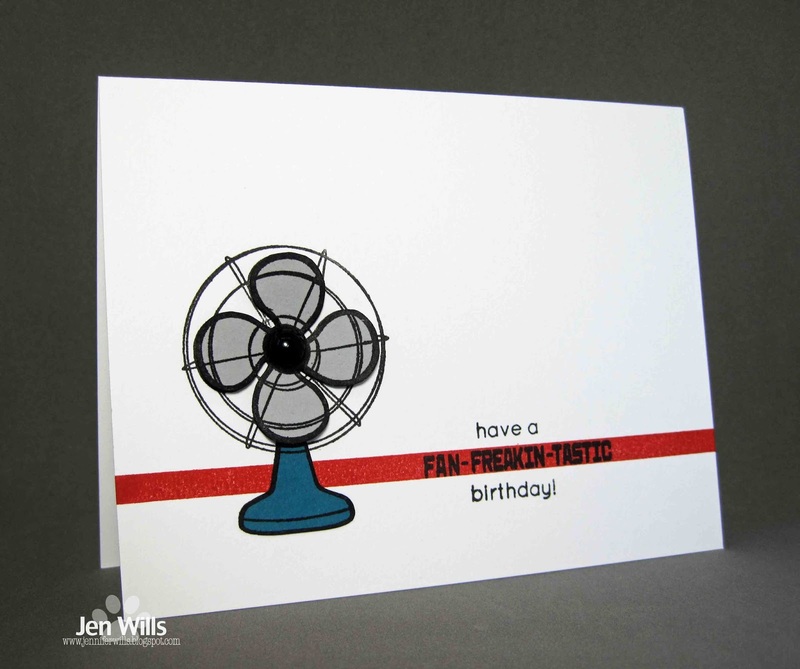 I also love the "fan-freakin-tastic" part of the sentiment so I wanted to highlight it when I made the card. I found a stripe stamp that fit the sentiment perfectly and stamped it in Poppy Parade. Then I paper pieced the fan, popped it up on foam tape and added a gem to the centre of it. Clean and crisp with a pop of fun color from the stripe. And now it's over to you guys - check out the fabulous inspiration from the design team and then play along! This is so fun Jen! Your sentiment is PERFECTLY positioned~it's amazing! GREAT design - love the bold colours and the way you've highlighted the sentiment! I was just going to say I want NEED that stamp! Fun card. Oh my goodness I am a huge freakin' fan of this card!!! Jen - just incredibly clever!!! I love this card...everything about it shouts fun. Terrific card Jen and so perfect for the cue word! Ha! Great take on that (difficult) cue word! Love how you did the sentiment, and your paper pieced fan is a fantastic image. I could use that fan in my spin class, as it is always nice to have a breeze when I am working hard. You said it Jen. Clear and crisp with a pop of color and a fun sentiment. Perfect. This is fun! Love how clean and graphic this is. Jen, I love this stamp set...too bad it is retired! Your paper-piecing adds so much dimension, it's fan-freakin'-tastic! Sweet card! and a wonderful tip you shared : ) I will try that in the future! I think your card is fan-freaking-tastic! Terrific design, Jen. Fan-freakin' tastic alright! This is so cool! Ba-doom doom dish!! You are seriously an awesome paper-piecer, Jen! Love this!! Hey Jen!! I love your card. The sentiment is super funny. I can't stop laughing. I love that fan stamp, its so realistic! !